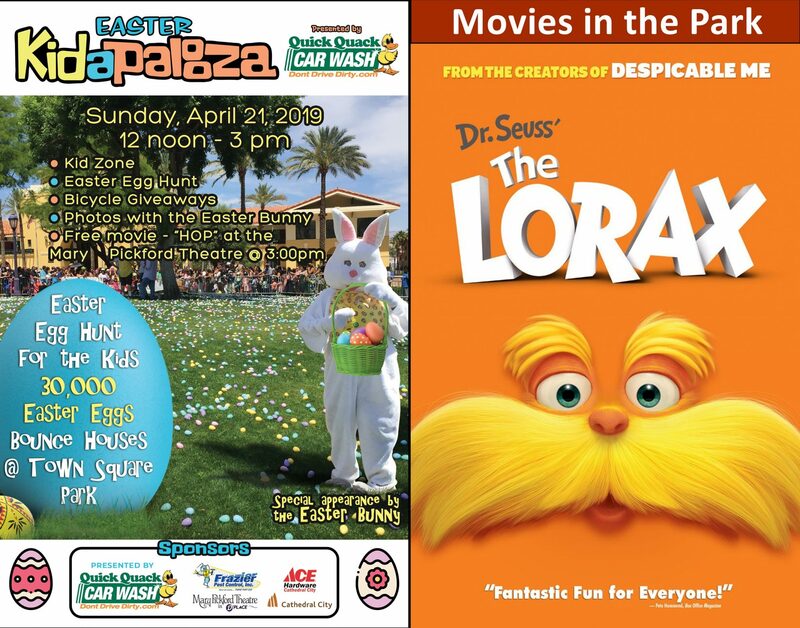 Get ready for two family-friendly events that are all centered on kids this weekend in Cathedral City! 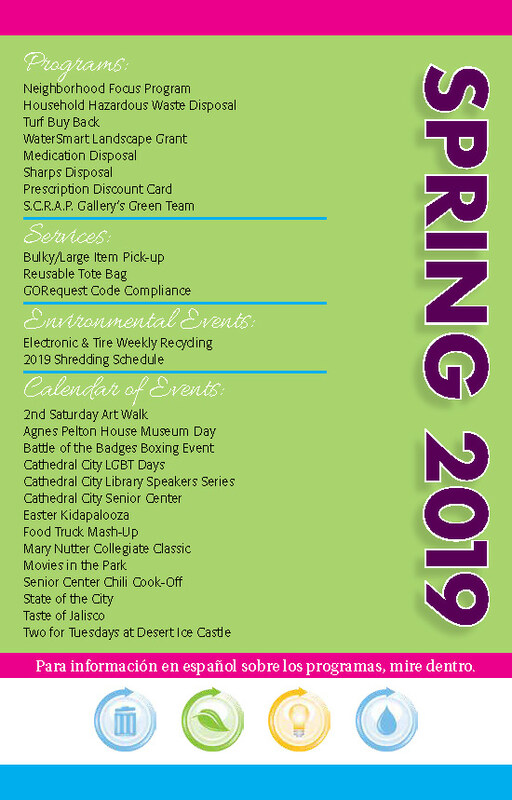 First, the Cathedral City Evening Rotary will offer its monthly “Movies in the Park” on Saturday, April 20th starting at dusk in Panorama Park, 28905 Avenida Maravilla, featuring the animated Dr. Seuss hit, “The Lorax”. This free event allows parents and kids to bring their outdoor chairs, blankets, snacks, and non-alcoholic beverages to enjoy the free movie on a giant blow-up screen. 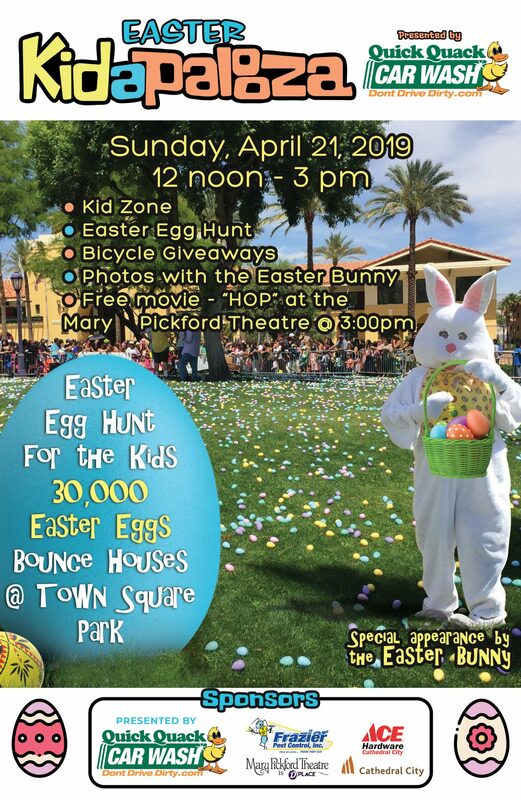 The second event, Easter Kidapalooza, happens on Sunday, April 21st from noon to 3 pm, located at Town Square Park in front of City Hall, 68700 Avenida Lalo Guerrero. Presented by Quick Quack Car Wash, families will enjoy DJ music, an Easter Egg Hunt for kids 5 to 12 years of age at 12:30 pm followed by Easter Egg Hunts for Toddlers, pictures with the Easter Bunny and the Quick Quack Duck, bouncy houses for kids, delicious food and beverages (for purchase) for a family picnic in the park, Earth Day Art Party for Kids by S.C.R.A.P. Gallery and splash play at the infamous Fountain of Life. Plus, get your free pass to the animated movie “Hop” as early as noon at the adjacent Mary Pickford Theater Box Office for a 3:00 pm showing. Seats are limited.